In Good Shape. EPA 26 MPG Hwy/19 MPG City! 3rd Row Seat, Rear Air, Dual Zone A/C, Keyless Start, iPod/MP3 Input, TRANSMISSION: 4-SPEED AUTOMATIC VLP, PREMIUM GROUP, ENGINE: 2.4L I4 DOHC 16V DUAL VVT, LOW MILES! Local Trade-in! AND MORE! Third Row Seat, Rear Air, iPod/MP3 Input, Keyless Start, Dual Zone A/C Privacy Glass, Keyless Entry, Steering Wheel Controls, Child Safety Locks, Heated Mirrors. PREMIUM GROUP Radio: 4.3 (REB), SIRIUS Satellite Radio, Interior Observation Mirror, Power 4-Way Driver Lumber Adjust, Leather Wrapped Shift Knob, Leather Wrapped Steering Wheel, Power 6-Way Driver Seat, Security Alarm, WHEELS: 19" X 7" PAINTED ALUMINUM Touring Suspension, Tires: P225/55R19 BSW AS Touring, UCONNECT VOICE COMMAND W/BLUETOOTH Rear View Auto Dim Mirror w/Microphone, Leather Wrapped Steering Wheel, ENGINE: 2.4L I4 DOHC 16V DUAL VVT: (STD), TRANSMISSION: 4-SPEED AUTOMATIC VLP: (STD). 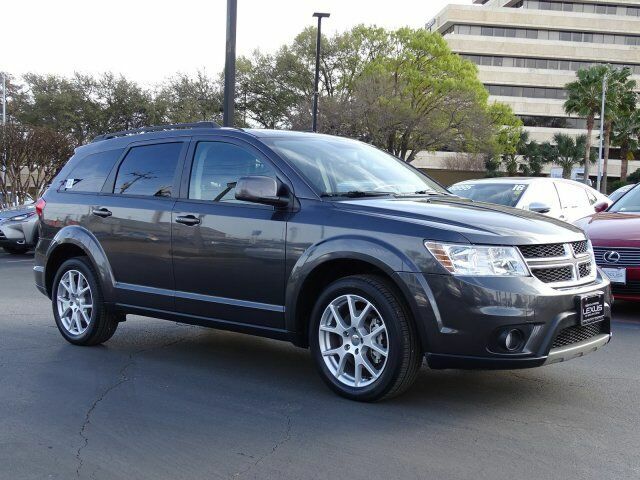 Dodge SXT with Granite Pearl Coat exterior and Black interior features a 4 Cylinder Engine with 173 HP at 6000 RPM*. LOW MILES! Local Trade-in! Electronic Stability Control, Brake Assist, 4-Wheel ABS, Tire Pressure Monitoring System, 4-Wheel Disc Brakes Great Gas Mileage: 26 MPG Hwy. Edmunds.com explains "Its suspension provides a smooth ride even over the roughest road surfaces, and that, in combination with supportive seats and a quiet interior, makes the Journey an ideal companion on long road trips. ".